Refining selective undergraduate admissions criteria so as to broaden conceptions of individual merit and encourage inclusive, high‐quality educational opportunities at the national level. 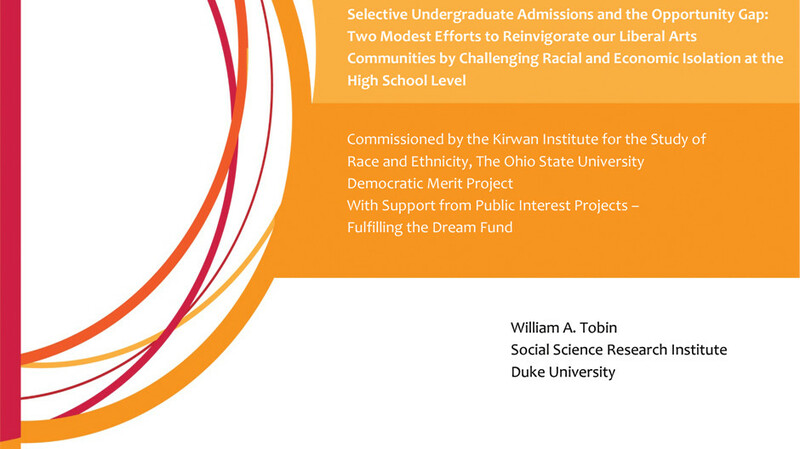 Might the highly‐ selective undergraduate admissions process play a role in encouraging parents to seek out or create inclusive, high‐quality educational opportunities that prepare their children to thrive in college and the diverse world beyond? Creating a college‐level research seminar that develops innovative and effective solutions to local problems precisely because it draws motivated high school students from three economically and racially distinct, but geographically proximate school districts. Can community members, government and school officials create an inter‐district educational opportunity that prepares students to take on the biggest challenges at our best universities and colleges? This paper discuses these two ongoing and not altogether successful essays in the hope that both the process by which this work has been undertaken and the broader issues involved would be of interest to practitioners and policy makers laboring to push similar rocks up different and perhaps steeper hills.